Meeting Program. 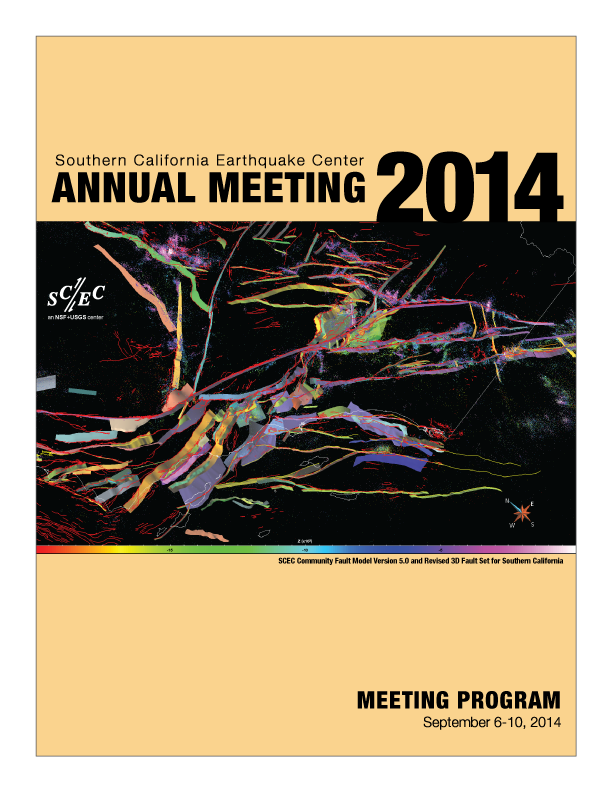 The 2014 SCEC Annual Meeting will be the third meeting of the SCEC4 Collaboration "Tracking Earthquake Cascades." The SCEC Science Planning Committee has designed the program to assess the progress towards goals set forth in the SCEC4 proposal and to prepare for the SCEC5 proposal. The meeting sessions comprise a series of thematic discussions to engage the SCEC community in the formulation of goals for SCEC5. Each theme discussion will kick off with a plenary talk, followed by brief reports by SCEC leadership outlining possible directions for SCEC5. The SCEC community will be able to provide input and guidance on those potential directions in the discussion following each report. DOWNLOAD! Click to download the complete 2014 Proceedings Volume or 2014 Meeting Program to be distributed at the meeting. 10:00 – 18:00 Group Meeting: SCEC Collaboratory for the Study of Earthquake Predictability (by invitation) 08:00 – 10:00 How can the hazard from simulated earthquakes effectively reduce risk in the real world? Sunday, September 7, 2014 10:30 – 12:30 What aspects of earthquake behavior are predictable? 17:00 – 18:00 Welcome Social 14:00 – 16:00 Here it comes! What just happened? How can SCEC better prepare to respond to future earthquakes? 10:30 – 10:45 Briefing on the M6.0 South Napa Earthquake, Ben Brooks 08:30 – 10:00 How can we communicate more effectively what we know and what we don't? 11:00 – 12:30 How do we deal with known unknowns and unknown unknowns? 14:00 – 16:00 What properties of the Earth and the faults within it are important for understanding system behavior? Meeting Abstracts and Presentations. SCEC’s long-term goal is to understand how seismic hazards change across all time scales of scientific and societal interest, from millennia to second. The collaboration emphasizes the connections between information gathering by sensor networks, fieldwork, and laboratory experiments; knowledge formulation through physics-based, system-level modeling; improved understanding of seismic hazard; and actions to reduce earthquake risk and promote resilience. The breadth of SCEC research and activities can best be seen in the meeting presentations, which include 286 posters and 7 invited talks. Use the form below to search and view all poster and invited talk abstracts submitted to this meeting.